Wikirank 0.95 is released! Now it possible to see the most popular Wikipedia articles with quality scores as of March 2019. Article additionally can participate in thematic ratings based on popularity scores and data from WikiData & DBpedia. More over, popularity rank history for the last year of each Wikipedia article is also available! 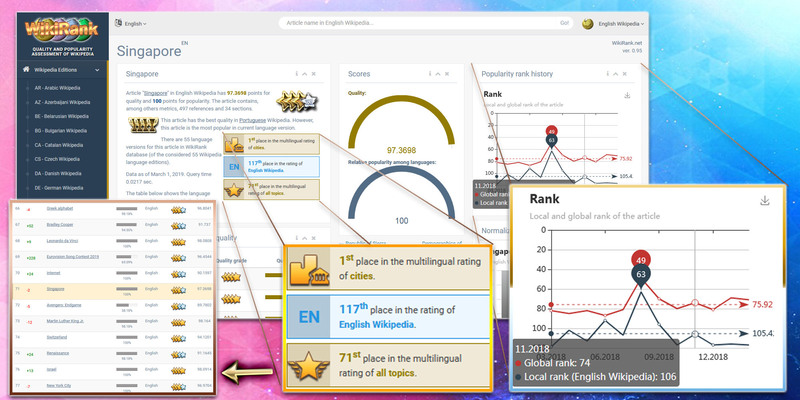 The chart shows the places of the article in a specific language version and the place in the global ranking (all languages). See example in article about Singapore in English Wikipedia.